A cobbler is basically a dish made from fruit filling poured in a baking dish and covered with pie crust, biscuits or batter. While baking, the juice from the fruit boils and bubbles up giving the pastry that delicious flavor. 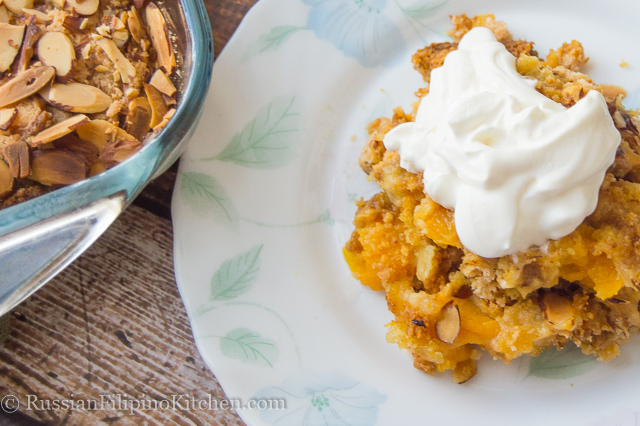 Of the few peach cobblers I tried so far, this one’s my most favorite. The great thing about it is that you’ll be surprised how easy it is to make. It actually just involves 4 steps, not counting preheating the oven and letting it cool down before serving. 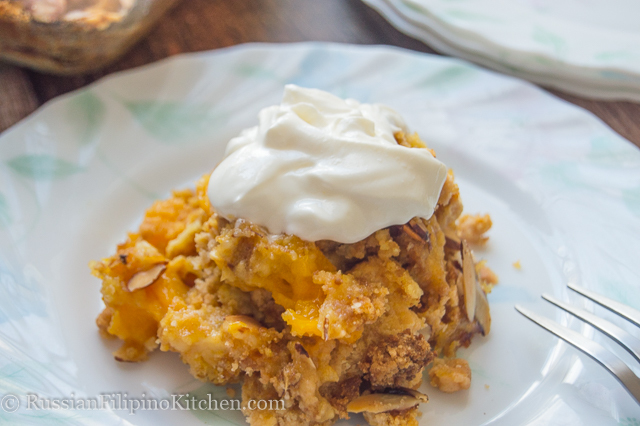 I credit this recipe to my good friend Beverly, who shared this delightful dessert to us when we visited her home in Stockton, CA a few years back. It was an instant love a first bite that I had to ask how she made it. I’m so glad she was very generous enough to share her delectable peach cobbler recipe. 2. 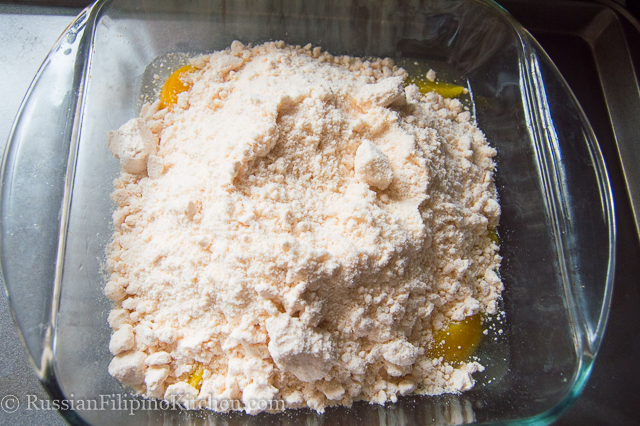 In a baking dish, empty canned peaches including the syrup. Arrange the peaches in one even layer. 3. Pour cake mix on top of the peaches. Press down with a spatula so the bottom layer is evenly covered. 4. 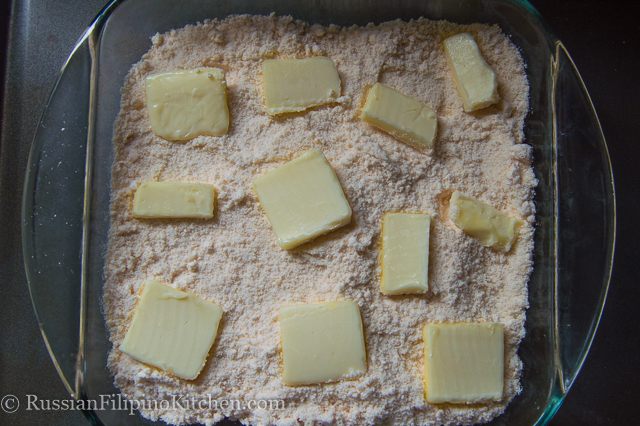 Slice butter thinly and place on top. Sprinkle with ground cinnamon and bake in the oven for 30 minutes. 5. 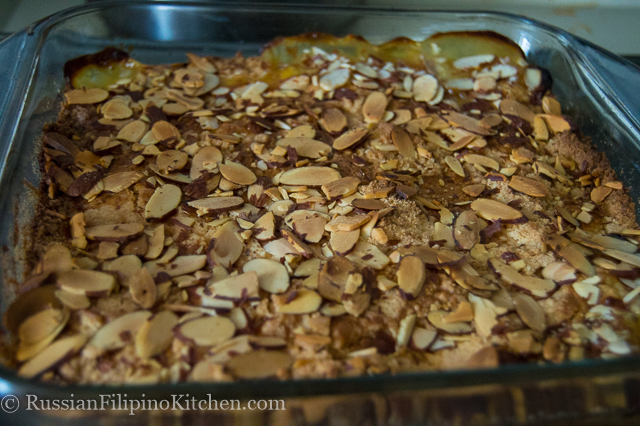 Remove from oven and sprinkle almonds on top. 6. Bake for another 30 minutes until the almonds are nicely toasted. 7. Remove from oven and cool it down to room temperature. Serve with your favorite topping and enjoy! 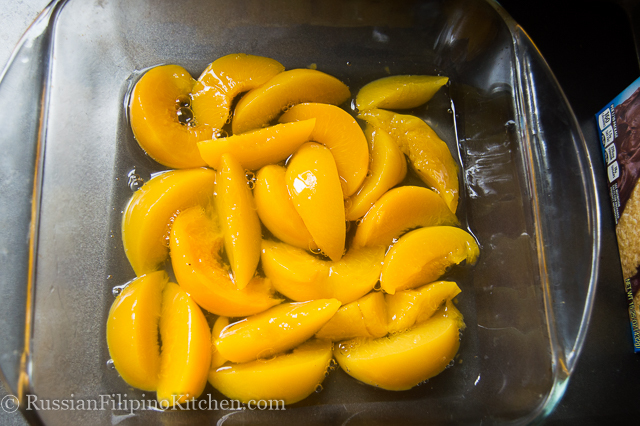 In a baking dish, empty canned peaches including the syrup. Arrange the peaches in one even layer. Pour cake mix on top of the peaches. Press down with a spatula so the bottom layer is evenly covered. Slice butter thinly and place on top. Sprinkle with ground cinnamon and bake in the oven for 30 minutes. 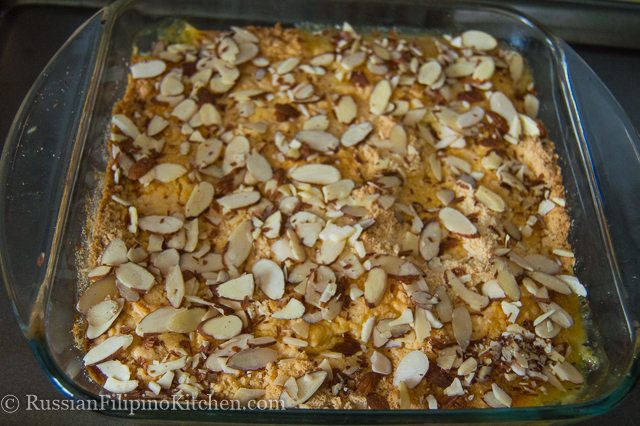 Remove from oven and sprinkle almonds on top. Bake for another 30 minutes until the almonds are nicely toasted. Remove from oven and cool it down to room temperature. Serve with your favorite topping and enjoy! This looks great. Love the idea of the almonds for a new dimension and added layer of texture.